Tuesday at the World Championships featured the men’s and women’s open singles round of 16, as the game’s best 4-Wall stars continued their quests for world titles. 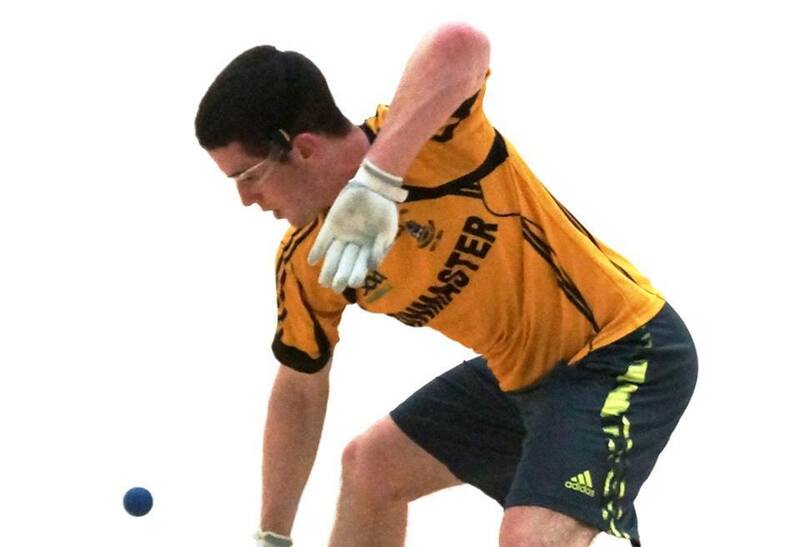 Paul Brady was in search of an unprecedented fifth consecutive world title, while his compatriot, Aisling Reilly, was in search of her second consecutive world title. Each of the men’s top eight seeds advanced in two games in Tuesday’s quarterfinal play, with none of the top eight being extended to a third game. The feature match of the session pitted Irish friends and rivals Martin Mulkerrins and Killian Carrol. The first game lived up to the advanced hype, with the pair exchanging the lead six times until Mulkerrins appeared to gain control at 19-16. A hesitant back wall kill shot attempt after scoring seven consecutive points allowed Carroll to stay in a rally he ultimately won on the 24th shot. Carroll seized the momentum and the first game by scoring the final five points of game one and raced to an 18-5 lead in game two before closing out his compatriot, 21-19, 21-13. The women’s seeds cruised in the World Championship quarterfinals, with top seeds Aisling Reilly and Catriona Casey yielding just four combined points in their respective matches. Martina “2M” McMahon defeated cross over superstar Sandy Ng in two games, riding a stiletto left-hand kill to Wednesday’s quarterfinals. Danielle Daskalakis overcame home-country favorite Maria Dugas, CNC defeated Dr. Samantha England, Maria Daly defeated WPH statistician Jean Kastner and Jessica Gawley defeated Ireland’s Aisling O’Keeffe. The 2012 Defending Champions, Luis Moreno & Andy Nett (USA/USA) looked sharp as they got past David Walsh and Patrick Clerkin in two straight games on Tuesday. Moreno & Nett have never dropped a match in major handball play; that includes both World Championship and US National Championship runs. Dominick Lynch & Gavin Buggy (IRE/IRE) almost doubled up Cody Townsend & Dalton Beall (USA/USA) and will look to upset the Moreno/Nett winning streak at 7pm Local Calgary Time (Wed). Current US National Champions, Sean Lening & Marcos Chavez (USA/USA) brought their unique modified “I/LAAC” doubles style to the show-court and walked out with a comfortable 15, 8 victory over Walsh & Moloney (IRE/IRE). This pins Restaurateur Rikki O’Gara & Father-to-Be Joe McCann (IRE/IRE) up against the off-beat style of Team Freak today at 5pm. 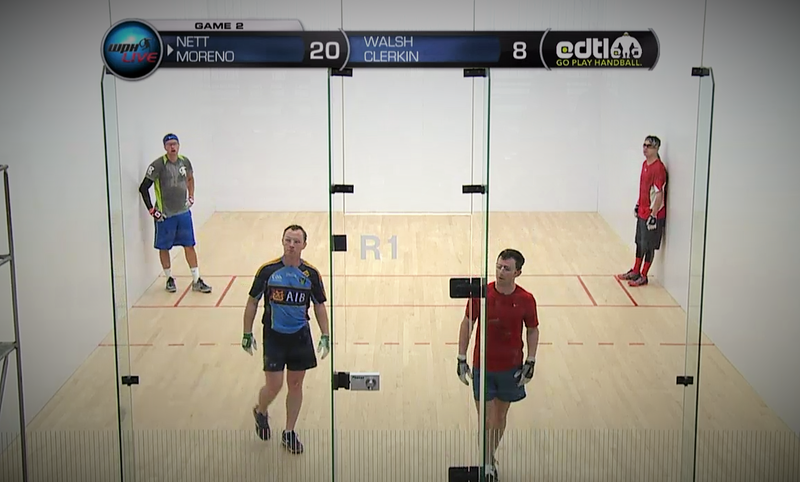 Nash/McCarthy, Carroll/McElduff, plus Mulkerrins/O’Connor all advance to the quarterfinals. The 2012 World’s Finalists, and arguably one of the greatest doubles-duos of all time, Paul Brady & Mike Finnegan (IRE/IRE) take their #2 seed to the show-court this late afternoon/evening at 6pm, after nipping Tadgh Caroll & Ryan Harkin (IRE/IRE). 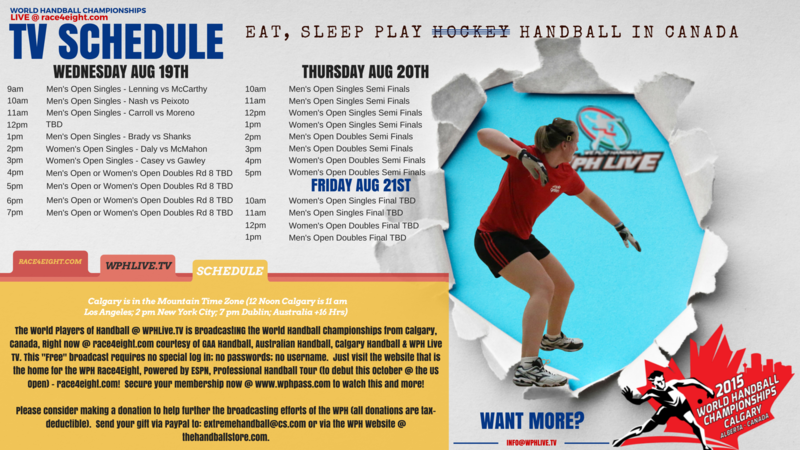 To watch men’s and women’s quarterfinal action from Calgary, go to race4eight.com. Action starts at 8 am mst, 7 pm pst and 10 pm est. Breakfast at the World Championships! What could be better!